Khao Lak Introduction - Construction de maison à Khao Lak-Thailande, maison à vendre, vend terrain et villa, house for sale in thailand, build builder house in thailand khao lak, land for sale khao lak,Property-Real Estate. 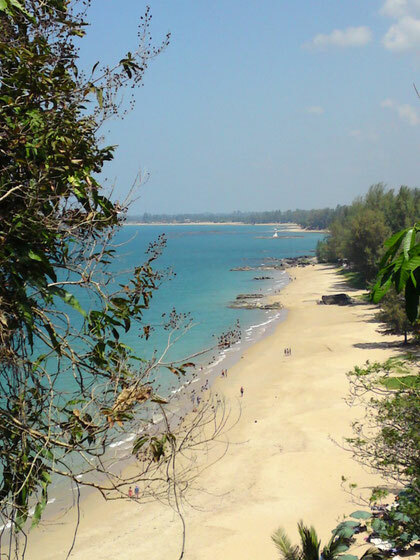 Khao Lak is located only 90 minutes from Phuket, is one of the most beautiful and peaceful sites all over Thailand. Arriving in Khao Lak, after the "mountain" you discovery the bay offers a marvellos panorama, located between the white sand beach along the Emerald Andaman Sea, bordered by palms, century trees, rubber plantations, and progress to the jungle of Khao Lak's Lamru national park. No less than 7 National Parks are around protecting air. Gorgeous and savage moutainous rainforests who throw to the long empty beaches that go on for ever. Discovering the ecosystem of the mangrove forests, snorkeling or diving in the middle of coral around islands, trekking on an elephant, stretch down the river in raft or on foot through the oldest rainforest on earth. Khao Lak offers a rare oasis for relaxation in a perfect tropical background with a splendid combination of cool rainforest, until to expansive white sand beaches.